Marygrove College - Top 10 of 2012-13: #8 WHAC Newcomer and More! 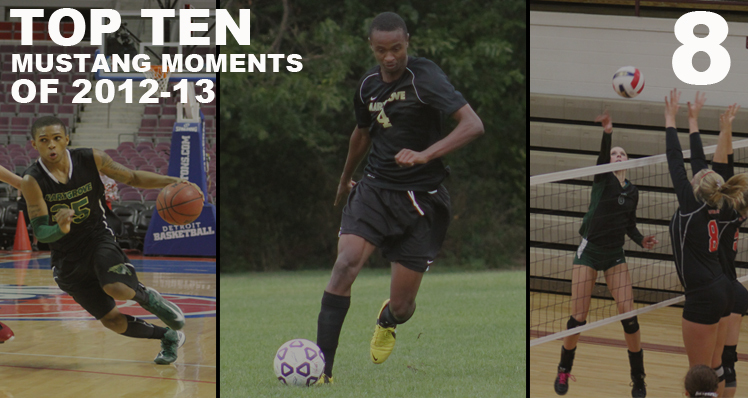 Top 10 of 2012-13: #8 WHAC Newcomer and More! The No. 8 moment in our Top 10 of 2012-13 is a storyline that continued to improve throughout the year. Heading into our first year in the Wolverine-Hoosier Athletic Conference (WHAC), it was apparent our returning student-athletes would need a bit of assistance from the fresh faces of incoming Mustangs in order to keep up with the powerful conference. With that said, many new faces stood out throughout the course of the fall, winter, and spring sports. However, one Mustang burst onto the WHAC scene with unparalleled success after being named a member of the conference’s honorable mention team and the WHAC Men’s Soccer Newcomer of the Year. With nine goals and eight assists, Abdoullie Jallow (Bansang, The Gambia/Rust) was instrumental in the success men’s soccer experienced in 2012 as the freshman helped lead the team to a semifinal appearance in the WHAC Playoffs. The nine goals was good for second on the team, while Jallow’s eight helpers were tops in 2012. Below is the release of Jallow being named Newcomer of the Year along with the rest of the men’s soccer WHAC awards. Jallow was not the only new Mustang to make an impact during the 2012-13 season. Katharina Hall (Livonia, Mich./Schoolcraft), women’s volleyball, and Diante Taylor (Battle Creek, Mich./Battle Creek), men’s basketball, also made a splash as new faces to not only the WHAC but to Marygrove’s campus last year. Hall quickly made a name for herself on Marygrove’s campus after the first few matches when whispers started to stir about her top notch ability on the court. In 2012, the talented outside accumulated 243 kills in 33 matches â good for second on the team. From the outside hitter position, Hall also managed to get in on 21 blocks during her first season as a Mustang. The junior college transfer heads into 2013 as the lone senior on the volleyball team. Taylor, a freshman on the men’s basketball team during the 2012-13 season, took over the role of leading scorer due to the absence of Darryll Dixon. Taylor was the first men’s basketball player since 2010 to average double digits scoring in a season (Darryll Dixon) en route to helping lead the Mustangs to an upset win over #17 Madonna University â a moment that may just make our Top 10 at a later date. Other top newcomers as referenced in our Mane Event awards were Kamry Miller (women’s soccer) and Ciara Moore (women’s basketball). Miller was fourth on the team in total scoring and tied for the team lead in assists. Moore was the second option women’s basketball behind all-time leading scorer Keara Marks and was thrust into a leadership role late into the season when Marks went down. DETROIT, Mich. — A highly successful first regular season in the Wolverine-Hoosier Athletic Conference (WHAC) culminated in a slew of awards for the men’s soccer team. Of the awards, the Mustangs’ all-time leading scorer Jordan Berry (Dearborn, Mich./Crestwood) was named WHAC First Team All-Conference. The senior striker earned an appearance on the conference’s first team after finding the back of the net 21 times this season. The impressive total was two-shy of the top spot in the conference to cement Berry’s first time selection. In all, Berry totaled 45 points on the season to complete a season in which he was one of the NAIA’s top performers. The senior ended the regular season fourth in the nation in goals and eighth in points. Freshman forward Abdoullie Jallow (Bansang, The Gambia) broke onto the WHAC scene with a first-year performance that included nine goals and six assists. The 24-point season was recognized by the conference as Jallow was named WHAC Newcomer of the Year. The honor goes to the top freshman or transfer in the conference. Jallow also earned a spot on the WHAC’s Honorable Mention team for his efforts this season. The standouts in the classroom were also recognized as four Mustangs earned a spot on the WHAC’s All-Academic Team. Seniors Jordan Largent (Mattawan, Mich./Mattawan) and Stefan McMillan (Saint Johns, Mich./Saint Johns) were named to the all-academic team due to qualifying grade point averages. Juniors Ahmed Almosawi (Dearborn, Mich./American Muslim Academy) and Jad El-Zein (Tyre, Lebanon/Fordson) also earned a spot on the conference’s all-academic team due to their diligence in the classroom. Senior keeper Malcolm Brinker (Plainwell, Mich./Plainwell) was named to the WHAC’s Champions of Character Team after embodying the NAIA’s Five Core Values of Respect, Responsibility, Integrity, Servant Leadership, and Sportsmanship. Brinker, active in the Marygrove community and beyond, has been a tireless volunteer for many projects during his time at Marygrove College.